The details listed would suggest that Bond’s regular suits do not have cuffs, double vents or four buttons down the front. 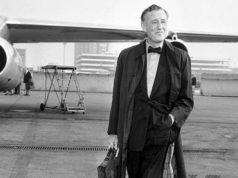 Since Fleming was English, “cuffs” would most likely refer to turnback cuffs on the sleeves (which Fleming occasionally wore himself) rather than trousers’ turn-ups. 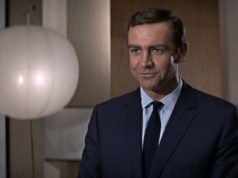 Double vents on single-breasted jackets hadn’t yet become the standard for English tailoring, and even though Sean Connery had already worn double-vented suits in Dr. No a year earlier it probably was not to Fleming’s personal taste. At that time it was still more common for single-breasted jackets to have a single vent or no vent. four-button fronts would come into fashion later in the decade, but at this time they may still have been seen as old-fashioned and were most appropriate for country suits. Bond’s usual suits probably have a two-button front like Fleming’s did. Always nice to see the one reference to a non-wristwatch James Bond watch cited.